There’s a tent camper in my driveway and a garage full of paraphernalia. Bags are being packed and heaps of grocery shopping is about to commence. We have a lovely five-day Spring break ahead of us and … We. Are. Going. Camping. For some of you that might be a typical vacation – your perfect idea of respite and refreshment. Mine would be someplace marked by 4-stars (at least), a spa, and valet parking. Which is probably why we don’t take many vacations! Among my closest friends I’ve somehow become attached to a princess reputation. Which is kind of ironic because lately, I’ve been the one scaling towers and fighting dragons – my tutu and tiara replaced by the sword and shield. Perhaps the pretty-pink-label has more to do with my pension for cleanliness, order, and modern conveniences. Which simply makes me like the rest of the Type A, left-brained, tidy people of the world, right? But, I have a husband and a 12-year-old son and the prospect of packing up the trailer and heading out to camp delights them. Their smiles far outweigh any cost I will endure. Sometimes God breaks through our comfort zones. He asks us to do things that aren’t normal, or easy, or even convenient. He stretches us in brand new ways and points us toward uncharted territory. It might not be our favorite activity, the safest route, or our chosen destination. Sometimes it’s to teach us and other times it’s to bless others. God breaks molds and chains. Through Him we break free from our past – from sin. With Him, we break apart that which opposes faith (fear, worry, doubt). 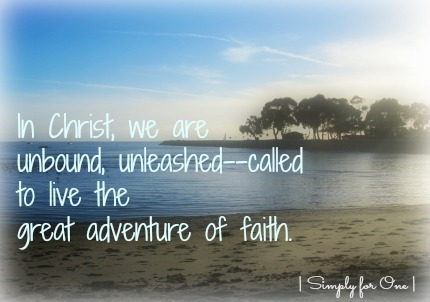 In Christ, we are unbound, unleashed – called to live the great adventure of faith. Sometimes being broken is exactly where He wants us. Surrendered hearts, empty hands, and a teachable spirit – it breaks all the rules the world would have us live by, but it positions us before Christ available to be used by Him. Now – don’t be misled. This camping trip is no survival expedition or trek into the great unknown. It’s 3-days at a lovely state park, nestled next to the ocean. The forecast is for a delicious 80 degrees and we’ll be surrounded by dear friends. This is more of a light tugging than a stretching. But this past year, God has broken ties. He has made me bend and move in ways I never imagined. He’s pushed, and pulled, and pointed me in a direction that has me scaling that tower, drawing my sword, looking that dragon right in the eye … AND believing that victory is mine. In comparison to all that – camping is a piece of cake. *This post is part of the Five Minute Friday link-up. This incredible community of writers participate in a weekly five-minute-free-write. It is purposed to be unedited – but my Type A (see!) personality binds me to a quick refinement and spell check. Most importantly it’s an opportunity to pour our hearts on the page over one pre-selected word prompt. This weeks word is: break. To learn more about this free write challenge, visit our hostess Kate Motaung and/or come join us on Thursday nights on Twitter (#fmfparty) for random conversation and great fun. Great words, Tiffany! And I hope you have an amazing and restful time away! I can camp forever–as long as I can bathe or swim or do something to get clean (the hotter the weather, the lower my tolerance for dirt and grime ;) ). We purchased a camping shower–and I can’t wait to go camping again and use it (we don’t really enjoy camp grounds because we like the silence and solitude of remote camping). Enjoy your ‘tugging’ and ‘stretching’–I’m always amazed by our capacity to change when we don’t feel like it but Jesus calls! Wow…you are brave, Anita. I bet you have great stories! Our campsite will have token showers so that’s a big plus. I don’t think I could do remote camping…maybe with some extra “stretching” I’ll work my way there. 😬 Thanks for visiting today! I love that God does stretch us beyond our comfort zones, breaking us out of them in ways that only He can. I hope you have a wonderful time by the ocean with your family and friends! Yes! I knew I wasn’t the only hotel camper! Now I have testimonies when my friends make fun of me. 😉 God is so amazing at stretching us and at doing it with grace and tender mercy when He knows we need it most…He gives us the courage for the great adventures! Thanks for visiting me, friend. Hugs. Aww, thanks Jennifer…your words always bless me too! I’m so glad you related…and that I’m not the only one who feels these things! :) I just spent $70 at Target on Lysol, bug repellant wristbands, and other “necessities”. Lord, help us all. 😂Photos to come! I’m a motorhome camper! But I haven’t done it since I was a kid. I wouldn’t be opposed to it but I’m like you, give me four stars and a spa any day! This resonated with me: “Sometimes being broken is exactly where He wants us.” I don’t necessarily feel broken right now, but I am open and ready to step into whatever is next – no matter what it looks like. I’m surrendered, and teachable. Great post! Have a fantastic vacation! The tent camper is actually pretty comfy, though no electricity, water, etc. Pray for me!! 😉 I’m reading a book by Pastor Chris Jackson, “Loving God When You Don’t Love the Church.” He has a great chapter on the difference between being wounded and broken…amazing, convicting, transforming. I’m ready to go where He leads too! So glad you stopped by, Liz. Great getting to know you thru FMF. Tiffany, you are so cute! I am totally “Type A” when it comes to cleanliness. But I actually enjoy camping. I think that comes from being a farmers daughter who has taught me to get dirty and also from working at Bible camp for 7 summers. Enjoy your break this weekend! You give me hope, Tara! Lol. I think being raised as an only child by a single mom probably has a lot to do with my reluctance with camping…we shopped instead! ;) Looking forward to this new adventure! Thanks for visiting me today…blessing to you. So beautiful! Love this my friend. God does break through comfort zones and for multiple reasons at once. I can see how having twins was a blessing, a challenge, and a critical lesson to transform me from self-serving to serving others. Refiners fire! Thank you, friend…mommyhood is definitely a mold breaker and game changer, isn’t it?! You are right…a refining process wrapped in a huge blessing. Thank for visiting. Looking for you to link up with us one week when your schedule allows! Hugs!! I’m a fellow I-don’t-like-camping-or-vacations-for-that-matter, and you’re so right! He breaks us in GOOD ways through taking us out of our comfort zones. Praise God! So glad I’m not the only one, Hannah! Yes…His ways do work together for good even when the process isn’t what we would expect. So glad you stopped by today. Blessings! Thank you, Jamie…looking forward to this adventure out of one of mine. :) Have a blessed weekend. This is a lovely post – I like your line about being broken and how it ties in to the word “break.” It’s a lovely nuance. Thanks, Paula…so glad you stopped by. He’s awesome that way, isn’t He…His word is alive! Thanks so much for visiting…blessings.